Rick's life was forever changed during the season 7 premiere of "The Walking Dead." “The Walking Dead” Returns For Season 7 Death Reveal! 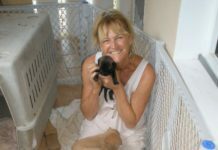 HOLLYWOOD—Most of have been eagerly waiting for nearly 6 months after that much-hyped season six finale on the AMC series “The Walking Dead.” Negan (Jeffrey Dean Morgan) made his epic entrance, but it would be at the cost of one of our series regulars. MAJOR SPOILERS: Stop reading RIGHT NOW if you have not watched the episode! With so much at stake fans speculated for months as to who would be on the receiving end of Negan and his bat, ‘Lucille,’ in the end it was: ABRAHAM and GLENN! Yes, season seven premiered with a whopper of a shocker, as the episode, ‘The Day Will Come When You Won’t Be,’ opened with blood smeared across Rick’s face and him echoing that he was going to kill Negan, just as the psychopath taunted our hero with his bloody bat in hand. Man the episode was so TENSE waiting for the big reveal that was not immediately disclosed to the viewer. With axe in hand, Negan than dragged Rick inside his trailer, and that’s when the audience got to see the blood of the victim strewn on the ground, but still no face! Like what the hell, how long are the writers going to drag this out for the fans? Our villain decided to take Rick for a ride, but it was apparent that Negan was calling Rick’s bluff to take the axe and put him out his misery, but of course Negan would have a gun as a back-up plan. When it comes to villainy, Negan is not one to mess with people, he’s evil and he instills fear in people. He forced Rick to go out in a zombie filled fog to retrieve his axe, and Rick fought valiantly to survive, as Negan treated him just like a puppet. At long last the revelation of who died was revealed 20 minutes into the episode, with the revelation that ABRAHAM was the first victim. It was brutal to watch, just brutal people. And our fearless one even in his death went out fighting. As a viewer it was painful to watch, just painful to see that death, and watching the faces of Michonne, Glenn, Rosita, Rick, Carl, Daryl, Maggie, Sasha and Aaron look on in horror. Rosita was just speechless, and when Negan demanded for her to take a look, Daryl lost it and delivered a hell of a punch to Negan’s face. That punch was costly people! 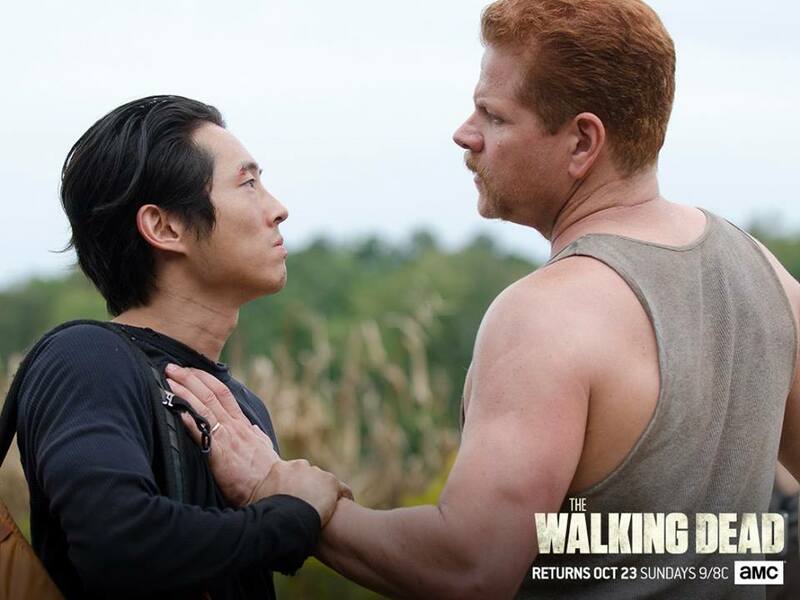 It was a sad day for “Walking Dead” fanatics as both Abraham and Glenn met their demise. I’m a bit annoyed at this point now people, it seems like the episode is dragging a bit, so things need to pick-up, and they certainly did as Negan than busted GLENN’S face in, with his eyeball popping from his skull. Fans did not suffer one death fans suffered, TWO. The level of emotions I’m feeling right now is just hard to even express in words. I was prepared to lose one character, but two characters, that is just plain brutal, but an unexpected twist from the writers. Rick was in a stupor, unable to comprehend what just transpired, so Negan who continued to beg for his axe, fired bullets onto the roof that left Rick jumping onto the zombie who was hanging from the overpass. Negan rescued Rick by firing bullets, as our hero had visions of all his pals having their heads bashed in, before delivering the weapon to his newest dictator. Why does it look like Negan is planning to take off Carl’s arm, no, he wants Rick to cut off his own son’s arm. Michonne begged Negan to not go through with this latest stunt. Our hero begged for his arm to be chopped off instead of Carl’s, as he cried for his son’s survival. Just as Rick was about to commit to the deed, Negan interrupted and made it clear that the gang will respond to all of his demands. Man, oh, man, I CANNOT wait till the day that Negan meets his maker, because it will be not only glorious television, but redemption well deserved for our heroes. 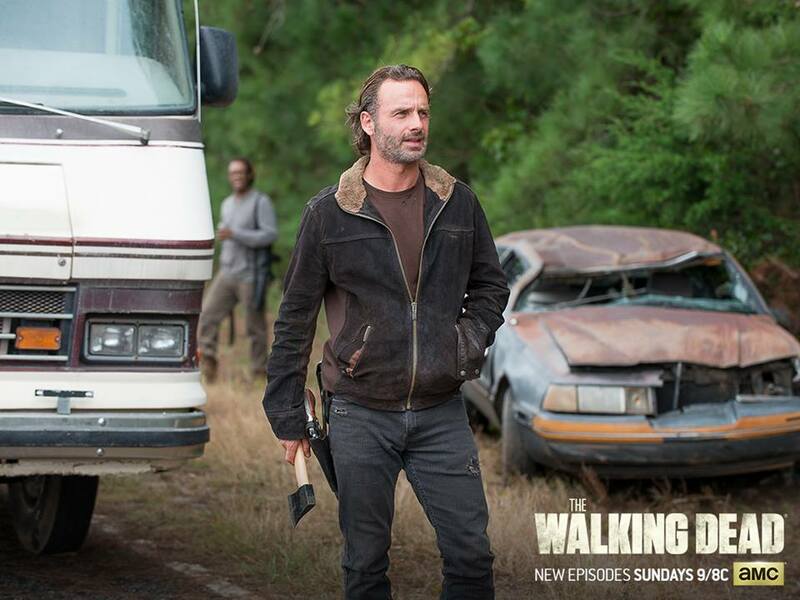 Daryl was loaded into a truck by Dwight, who Negan plans to utilize as leverage. Just like that the big bad villain and his minions dispersed. As the survivors sit, attempting to decipher what just transpired, Rick called out to Maggie who hell bent on seeking vengeance and building an army to tackle the evil that was just unleashed. Sasha decided to step in to assist Maggie on her journey as the others returned back to camp. Rosita could barely compose words to express how she felt. Carl, Aaron and Rick stood by Maggie’s side as they bid adieu to Glenn, the same sentiment was echoed as Sasha and Eugene helped Rosita ensure a properly burial for Abraham. In those final moments, we witnessed pure sadness from Rick was he drove the trailer off. Season seven kicked off to a epic start, and I can only imagine what will transpire. Until next Sunday “Walking Dead” zombie lovers!